Holly Shaw: Wordless Wednesday: Do They Sell These In Bulk? I guess times have not changed THAT much?? And all the nerve pains and diseases (in fine print). Oh my! Too funny. So funny, where did you find that sign?! The sign caught my eye at our Spaghetti Warehouse and made me laugh. 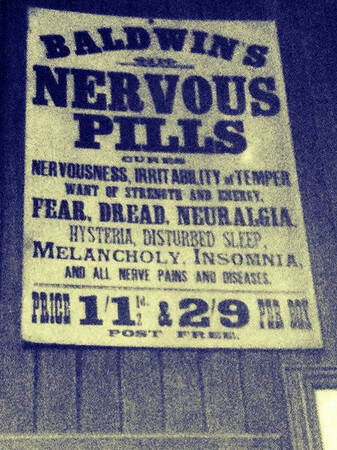 I definitely need some of those magic pills for irritability and want of strength and energy. Ha! They were probably opium with a dash of B-12.